Since publication of his first professional work in the early 1980s, Jamie Delano has made a diverse contribution to the comic book medium, scripting both original works: World Without End, Tainted, Ghostdancing, Hell Eternal, Cruel and Unusual, Territory, Outlaw Nation and publisher-owned properties such as Captain Britain, Dr Who, Night Raven, Hellblazer, Animal Man, Batman/Manbat, Shadowman, Crossed. Jamie is also the author of three novels: Book Thirteen, Leepus | Dizzy and Leepus | The River. 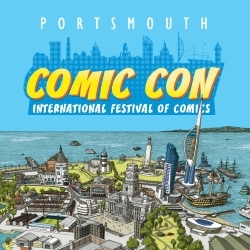 This is Delano’s first visit to Portsmouth Comic Con. As one of the true British comic maverick creators, Delano is a great addition to the show.